"The Library Association of the City of Pass Christian" was formally organized on June 19, 1908. Its founding officers and members of the Board of Directors were: Isabel Bowman Finley, President; Jennie M. Dempf, Vice President; Ada V. Davis, Secretary & Treasurer; and Margaret Logan, and Julia Hart. The Town Library physical description: It has been estimated to have been built circa 1855, consisting of a one-story four-bay frame cottage with an inset gallery. Sometime after 1910, the house was moved back from the sidewalk. Historic Chain of Ownership: The whole peninsula of Pass Christian was originally owned by the Widow Asmar beginning in the 1770s. Of the vast plantation and dairy farm, in 1799, the (Caucasian) Widow deeded a tract of her land to her freed slave, Charles (Charlot) “Asmard.” Through the Charlot Will of 1834, and Charlot’s death in 1835, his remaining properties were allocated to his heirs, among them, Joseph Labat, Sr. Following Labat's death, his lot was further divided into 4 equal lots of 42' 9" Gulf frontage, of which, the easternmost lot was given to his daughter, Adelaide Labat Piernas. On March 28, 1855, Louis and Adelaide Piernas sold the lot for $700 to Enewoldt August Johannes Jebens, paid as $400 cash and a $300 mortgage paid off and recorded in 1856. The Jebens' lot was bounded on the East by a lot formerly owned by Jean Baptiste Toulme (later by John W.F. Knost), and on the West by Joseph and Amelia Jolly (heirs of Joseph Labat, Sr.) Note: Labat, Sr., Piernas, and Jolly were Free Persons of Color. On May 25, 1907, Widow Augusta Jebens and four daughters sold the Beach front lot of their property to the “Pass Christian Public Library Association” for $700 cash. The 42' 9" lot was situated between Beach Boulevard and the Gulf, Mrs. Carrie Dempf on the East and Mrs. Marie Brown on the West. In June, 1908, Widow Augusta Jebens (widow of Enewoldt Jebens) and her four daughters (Lucy Sanger, wife of Charles Sanger of Bay St. Louis; Agnes Doris, wife of Charles Doris of New Orleans; Bertha Jebens of New Orleans; and Margaret Kestner, wife of Adolph Kestner of Pass Christian) sold a second and greater portion to “The Library Association of Pass Christian,” in the amount of $1532.17, of which $532.17 was paid in cash with a $1000 promisory note payable in one year with interest. The 32' 9" by 490' lot and house was situated between Beach Boulevard and Second Street --- except that on the East was an adjoining ten-foot strip by 490' sold that day to Mrs. Carrie Dempf --- and situated on the West of the "House Lot" was Mrs. Marie Brown. On July 5, 1910, “The Town Library Association of Pass Christian” swapped a 5' strip on the East side of its Beach Front property for a 1' 6" by 250' strip on the West side of the Mrs.Carrie Dempf 10-foot strip as acquired by her from Jebens in 1908 --- as was executed by Mrs. Jennie M Dempf. On November 5, 1954, the "Pass Chrisitan Library Association” confirmed a 1949 sale for $1,100, consisting of two parcels of land sold to Mr. and Mrs. John Henry Knost. Beach Front Lot: Measuring 37' 9" wide by 230 feet situated between Beach Boulevard (Front Street/Scenic Drive) and the Gulf. 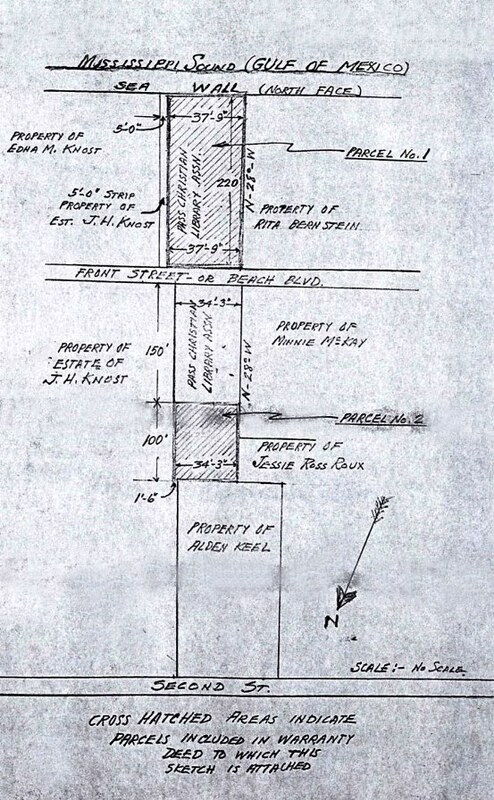 Inland Lot: Measuring 34' 3" by 100 feet bounded on the South by the Town Library, on the East by the Knost Estate, on the West by Minnie McKay and Jessie Roux, and on the North by Alden Keel. The sale by the Town Library to Alden Keel for the lot fronting Second Street is not shown herein and has not yet been researched.